When we think of pop culture, chances are we don’t think of welding. Images of sparks flying off of electric arcs, however, have been a part of history and pop culture for a long time. Whenever Hollywood or even the government needs to depict strength, innovation, and industry, they use visuals of welders at work. Following are some prominent welding scenes from film, television, and history. When Hollywood producers want to portray something being built, they often show welding. 1 If you’ve watched shows like MacGyver, The A-Team, Mission: Impossible, Firefly, Babylon 5, and Star Trek, you’re likely to have seen someone welding something. If you’re into reality TV, Top Gear and Mythbusters have often had welding occur somewhere in the program. When it comes to movies, you’re likely to see welding as part of repair or construction. In The Empire Strikes Back, Leia, Han Solo, and Chewbacca are constantly repairing the Millennium Falcon using—you guessed it—welding. What that says is that even “a long time ago in a galaxy far, far away,” they had welding skills. That’s how ubiquitous welding is. When we talk about historical figures and welding, we have to give a nod to Rosie the Riveter. When it came to women working tough industrial jobs during World War II, Rosie was an icon. She inspired one out of four married women to do their part for the war effort and work in factories. Rosie the Riveter was part of the U.S. government’s campaign to recruit women into the munitions factories while the men were away at war. The factories needed labor, and women were willing to learn welding technology to provide it. The campaign sparked more than patriotism. Rosie the Riveter made inroads for women into jobs that were once considered for men only. She showed that welding was a skill that men and women were equally capable of doing well. If you’re looking for main characters in movies that are welders, consider Flashdance. This 1983 movie depicts a woman applying her welding training during the day and her talent for dancing at night. While dancing won out for the main character, Flashdance showed the rare depiction of a woman in welding. The movie Cast Away opens with a woman named Bettina Peterson who creates welded metal sculptures. Again, this movie depicts a woman is welding. Currently, there are efforts to recruit more women into the industry. If you’ve ever watched MythBusters, you know that Adam Savage and Jamie Hynemen are constantly welding. In fact, they even shared their “workshop wisdom” with the magazine Popular Mechanics, offering tips for MIG welding and metal tubing. 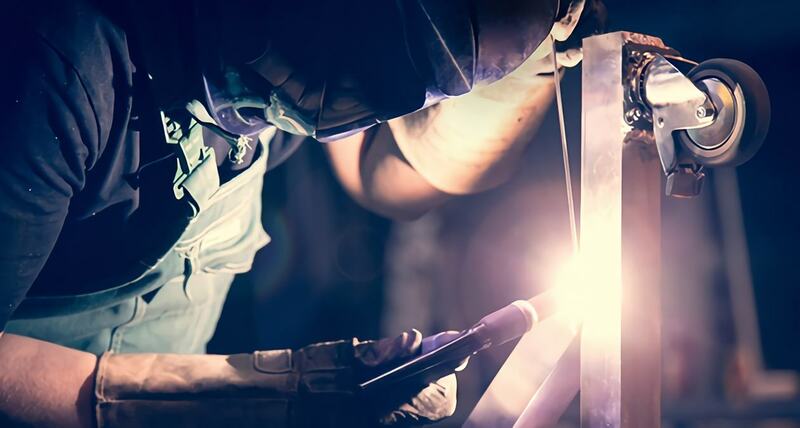 Prevalent in pop culture and history, welding plays an important role in the stories in which it appears. Could you imagine if there wasn’t welding in any of the movies or TV shows mentioned? Could MacGyver have destroyed Murdoc’s flamethrower if he didn’t know how to build an arc welder out of a car battery, some jumper cables, and a radio antenna? Could the Millennium Falcon have been repaired without welding? Whether in fact or fiction, welding is a part of our daily lives whether we are aware or not.